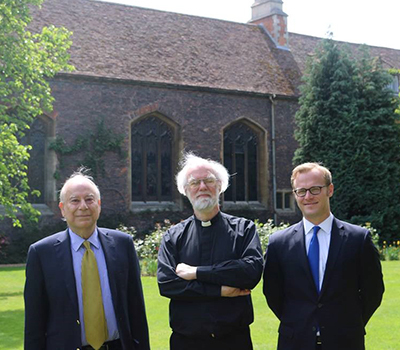 Graduate Student spotlight: Harrison Akins (right) with Ambassador Ahmed (left) and former Archbishop of Canterbury Rowan Williams (center) in Cambridge during fieldwork in the UK. Harrison Akins, a PhD student in our department, served as the associate producer and director of cinematography for the documentary film, Journey into Europe, which he presented to the Southeast Regional Middle East and Islamic Studies Seminar Howard H. Baker Jr. Center for Public Policy April 16, 2016. The film, which has also been screened worldwide, is part of a larger project by Ambassador Akbar Ahmed, the Ibn Khaldun Chair of Islamic Studies at American University and former Pakistan Ambassador to the UK and Ireland, examining the history and contemporary challenges of the Muslim communities of Europe. Relying on fieldwork in ten European countries over a two-year period, Ambassador Ahmed and his research team, including Akins, who served as the Ibn Khaldun Chair Research Fellow prior to beginning his PhD, examined controversial issues surrounding the European Muslim communities including Sharia law, terrorism, the building of mosques, female dress, and the pressures of immigration and multiculturalism. The Stiftung Mercator Foundation of Germany, the British Council USA, and American University’s School of International Service provided support and funding for the project.